Orange is the New Black has me thinking about the experience of getting arrested and doing time. This is a series of digital drawings based on mug shots and other relevant images I found looking around the internet. What I found made me realize that there is a history of women being incarcerated for gender based crimes. 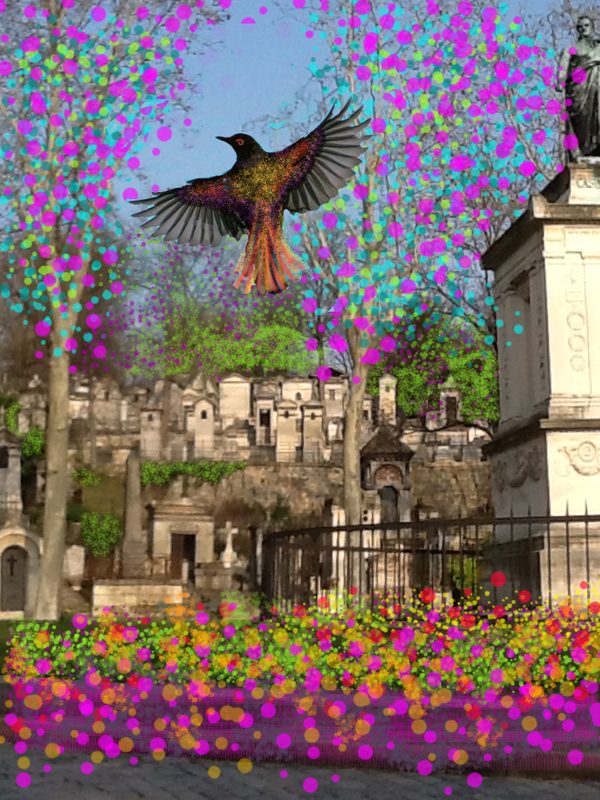 When ever I travel I remember that I really enjoy digital drawing. 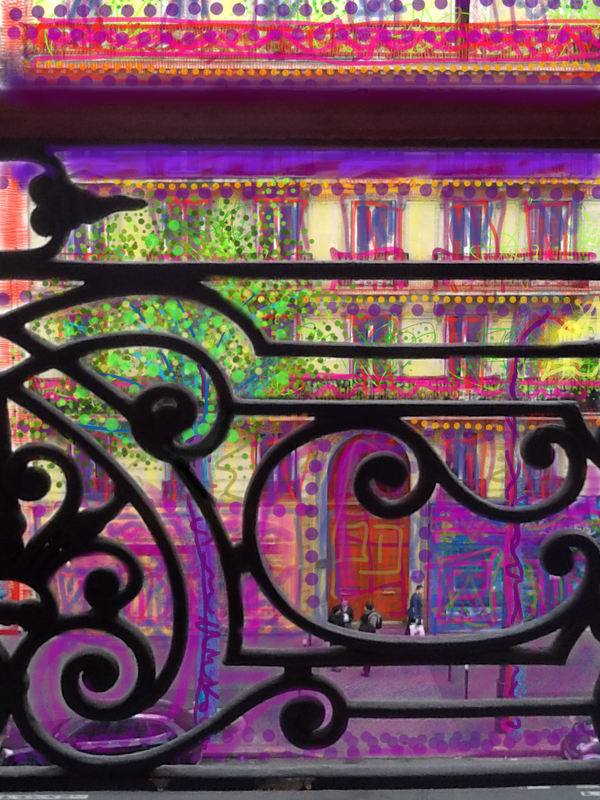 Here are the latest from my trip to Paris. 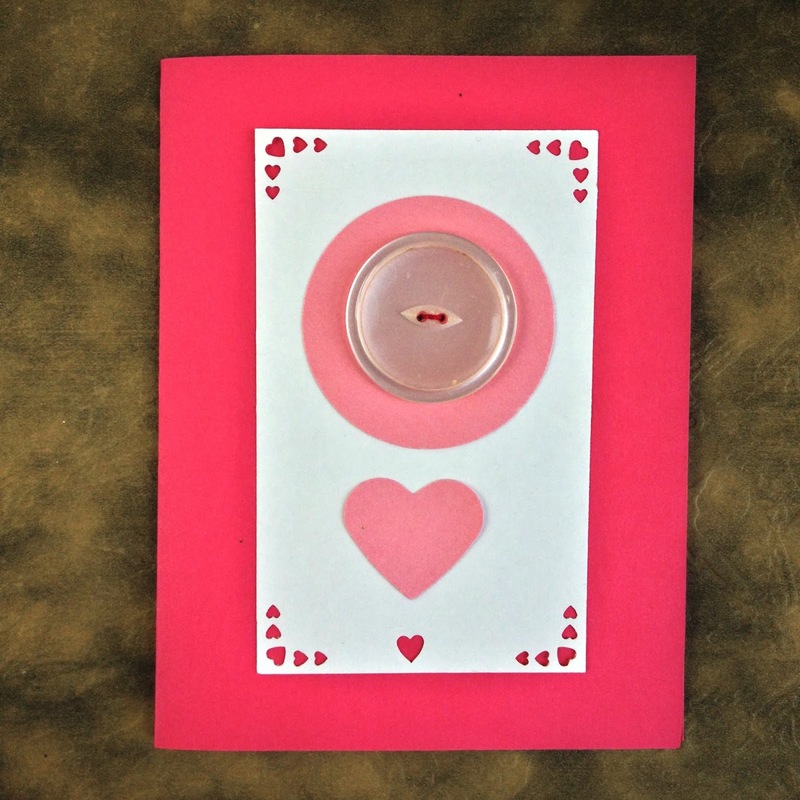 A button Valentine for your sweetie! This is a set of buttons made from a hand embroidered tea towel. The button card is designed just to show these buttons. I get a kick out of the old button cards that gave visual suggestions on how to use the buttons. Here I have recycled one of the old images to display some hand dyed buttons. Last night was the closing reception for Art Dolls 3 at the Irma Freeman Center for Imagination. The show was on display for a month and it was well received. Art Dolls 3 was a collaborative doll making exhibition and education project of the Jane Street Art Doll Collective. There was an excellent turn out & sales were good. I enjoyed watching people interact with my art. The Jane Street Art Doll Collective. The show was a wonderful way to end a year that contained a number of challenges. It was particularly meaningful that so many friends from out of town came to the opening night. I'm preparing for a show of my dolls at the Irma Freeman Center for Imagination. It opens the first Friday of December. Showing with me are Joyce Compton and Chris Fondi. About half of what I'm showing are wall dolls and they are easy to display. Standing dolls need to be on platforms or pedestals. That's a bit more challenging. 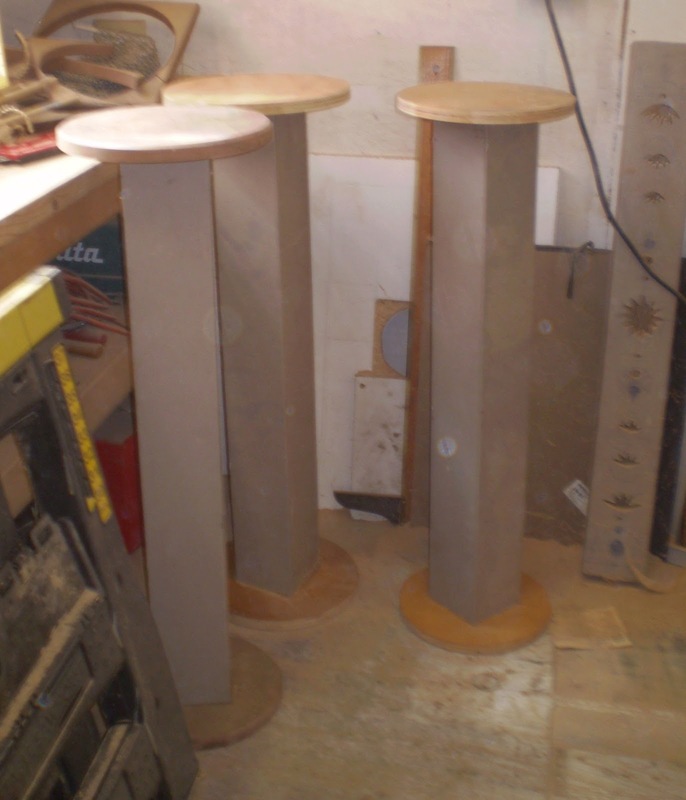 I've been busy making pedestals and platforms. Fortunately I have access to a great place to build my displays. 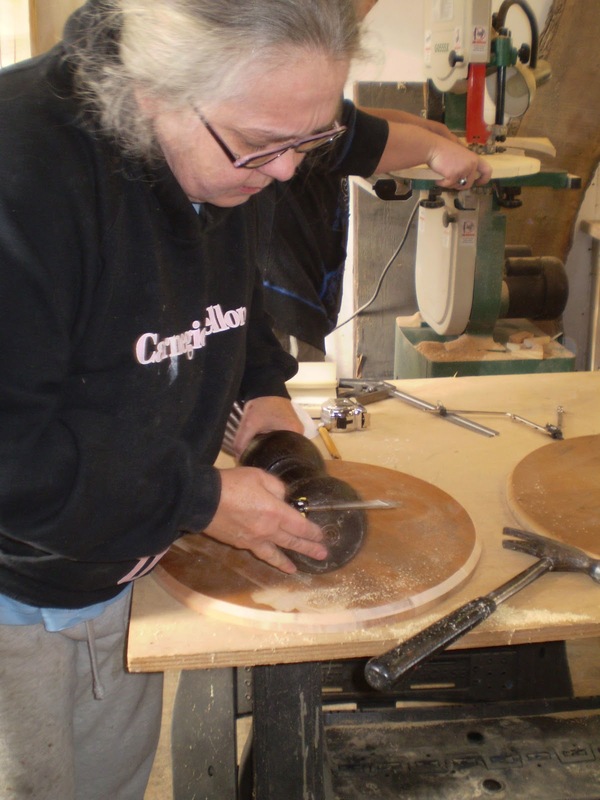 The Lillian Street wood shop is a supportive well equipped studio. I always have fun when I'm there. I also have studio space at home where I can do finish work on the displays. 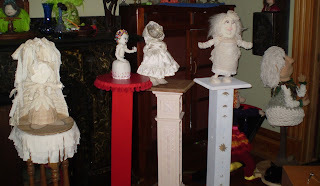 Each doll will have a distinct pedestal or platform geared to it's display needs. Most of the materials in the displays are repurposed wood. Here you can see pedestals I made from recycled porch posts purchased at Construction Junction in Pittsburgh. I build them in batches of similar design. They become more differentiated when they are finished. After the displays are built I take them home and paint or stain them to suit the personality of the doll that will be on it. The white pedestals in these photos just have a prime coat of paint. They will be painted in coming days. In a few cases I've added fabric or trim to the pedestal. Several of the pedestals have turned out to be fancy such as the one below. They are especially fun to build. I've been restraining myself from getting elaborate with the displays because it's a show about doll making and not woodworking. 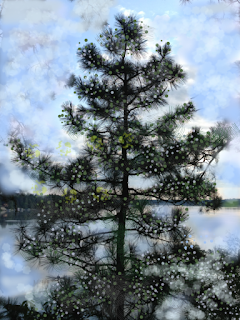 Digital finger painting is engaging. I did these on my iPad with the Brushes app. For the past six months I've been plagued by various health experiences that have affected my ability to breath easily. After much doctoring and more medication than I've taken in my adult life I have a diagnosis that seems to be right. Somehow, I've acquired asthma and an allergy to something that is unknown. While there are more doctor visits and tests planned, the new medication program seems to be working and I feel better. I finally can breath easily and I have some energy. There are small victories. I am now sleeping in my bed and not a recliner. Small stuff but important. A core belief of occupational therapy is that participation in meaningful occupations has a positive impact on our health and well being. During the time that I've been navigating these challenges I have given my times of best energy to my teaching and my caregiving of a family member. While these are meaningful occupations they are not art making which is essential to who I am. In addition to taking the medical route in my quest for healing, I also began to spend small amounts of time working on art projects. 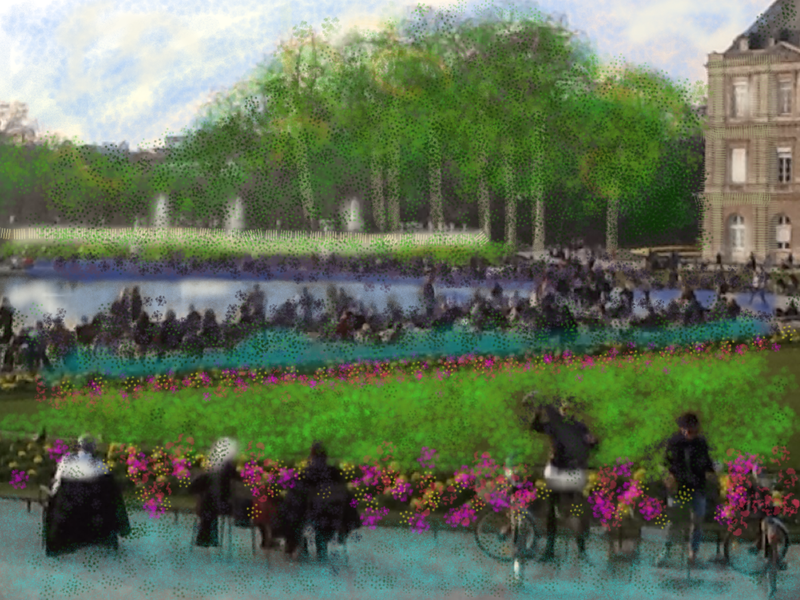 Twenty minutes of art and then forty minutes of rest. 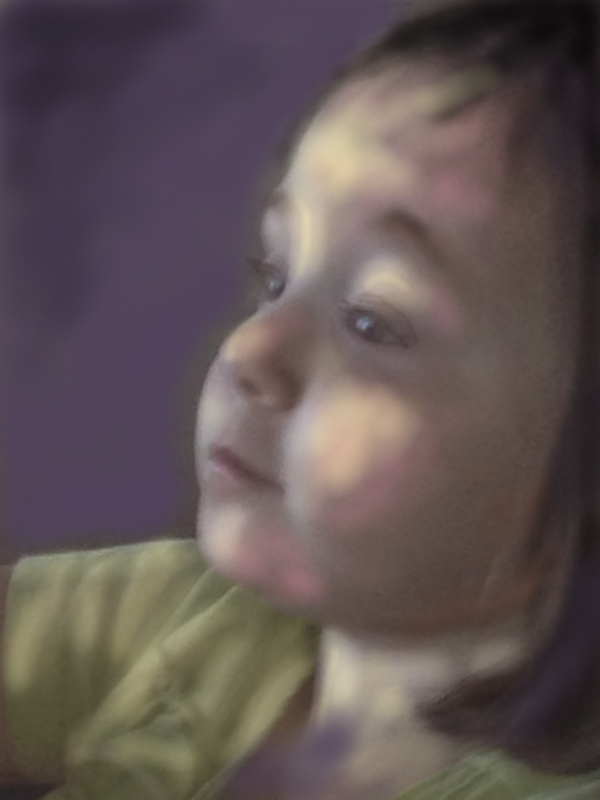 Slowly the amount of time I could sustain art activity grew and I felt more like myself. Yesterday I spent over three hours doing woodworking at the Lillian St. wood shop. I went home tired but happy. 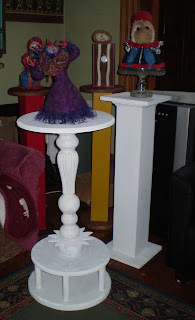 I built a pedestal to display one of my dolls. I feel so much better! There has been great progress with the Lillian St wood shop. The chimneys are gone! This may sound like a small change but its not. The demolition of the two chimneys created holes in the roof and the floor, scars on the walls and a large pile of bricks. The demo crew took care of closing off the roof and Beth Rogers patched the floor and walls. She then went on to moving a support post and building a lovely long work bench. This change has created a lot of useful space. This photo is the before shot. Notice the chimney on the left and the random arrangement of machines. This photo show the same area of the shop from a somewhat different angle. The counter has had a wonderful organizing effect. Machines are finding their places. The area to the left of the counter is a "parking lot" for larger machines on wheels. Chris Fondi, Beth Rogers and I spent Saturday, May 5 working on various wood working projects and more organizing. Chris and Beth are chatting and think they are not in the photo. The lumber rack on the far right is much improved but it still needs a bit more work. It was great to get back to the shop. I've had some health challenges this spring that slowed me down. I'm feeling much better now and can breath freely again! Spending a day working at the shop made me feel like I am myself again. This post is part of an occasional series about artists who don't have much presence on the internet. Johnson Antonio is a Navajo artist (born 1931) who began carving figures after he retired from working on the railroad around 1980. He calls his carvings "dolls" and they depict real people. They aren't traditional Navajo carvings. He uses found materials and watercolor paints. He lives in a remote area of New Mexico with his family. 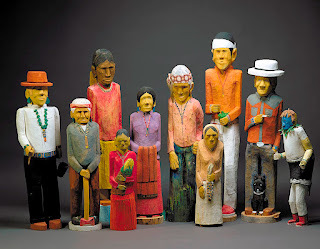 He is apparently well known to collectors of naive folk art carving. He does not have a web site. His work is available for purchase from several sites. I encountered his work and the above photo while virtually visiting the Smithsonian Institute. Several people have asked me how I got an article about my dolls published in Art Doll Quarterly (ADQ). This post is a description of how I thought about the process and what worked for me. ADQ is looking for article submissions that are almost ready to publish. If they are choosing between two submissions of equally well made and designed dolls they will always select the article that is well-written and accompanied with excellent high-resolution photographs. Think of it this way. The ADQ staff wants to do as little work as possible and still produce a good magazine issue. If you want to get published in ADQ you need to do much more than make great dolls. 1. Develop a coherent body of work. I’ve had my dolls published twice and each time I made eight to twelve dolls that are were related to each other. You may be able to get a publication with a smaller body of work. The important point is that the dolls need to tell a story both individually and as a group. 2. Get well-posed and styled high-resolution photos of your dolls. At first I hired a photographer and paid professional prices for the photos. That can’t happen often because of the expense! Then I tried semiprofessional photographers and got less pricey and lower quality photographs. You get what you pay for with photos. So I’m working on improving my photography skills and equipment. (The best thing that I have done to improve my photography was opening an Etsy shop. There is no way I can hire someone to do all that photography. I had to learn. It has taken time and a high tolerance for frustration but I am slowly getting better with practice.) If you are going to take your own photos, look at how the dolls ADQ publishes are posed and styled. 3. Edit the photos and toss the ones that don’t work. Some dolls are not as photogenic as others. At this point I usually cut two or three dolls from the group because I can’t get a good photo. I have trouble taking photos of dolls that have shiny or fuzzy parts. I always take photos with simple backgrounds. 4. Write an article about your dolls. Tell your story. Is it about how you make the dolls? Is it about the dolls’ characters? Are you championing a cause? Your article must be well written and have a good narrative flow. Get some feedback on your draft article from friends. Friends who read ADQ may be particularly helpful. Triple check for typos, spelling errors and grammar mistakes! 5. Package your article for submission. In addition to sending a disc with all the files, I also send a hard copy of the article laid out with illustrating photos. For the Stockinettes article I included a miniature version of the aluminum armature because that was such an important part of my story. Send a self-addressed postcard with your package if you want acknowledgment that they received your submission. Put your contact information on everything in your submission package. 6. Be prepared to wait for months. They plan their issues far in advance of publication. One day you may get an email from the editor of ADQ initiating a discussion about publishing your article.